Four blasts reported in Saudi Arabia within one day. Near the US consulate in Jeddah, Qatif, and in Madinah near Jannat ul Baqi and near Masjid e Nabvi. This is not a confirmed story as the news is still being confirmed by media. 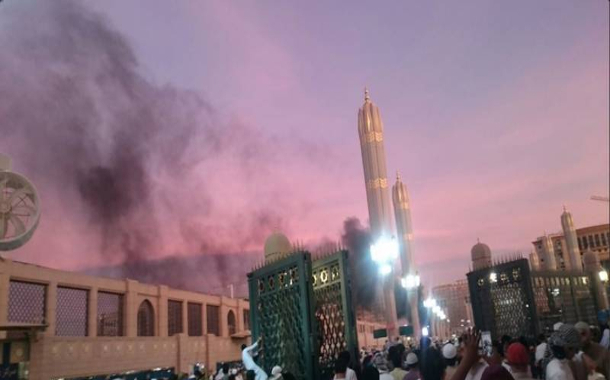 According to some reports, blasts are also heard near Masjid e Nabvi, but some says it was a cylinder blast. Other then that, blasts have been reported near the US consulate in Jeddah, and outside a Shiite mosque in eastern Saudi Arabia, near Jannat ul Baqi. In total, 2 (two) blasts took place in Madina, 1 (one) in Qatif, and 1 (one) near US consulate in Jeddah. The news is reported differently by different news channels. Some news channels reported 4 blasts and some reported 5. Some reported it as a cylinder blast while some reported it as a suicide blast. May Allah bless and protect the Holy land, Ameen. #PrayForMadinah is also trending on Twitter.